A Pumpkin painting/carving party is the perfect way to celebrate Halloween with young children. Kids love getting together for a party with their friends just as much as adults do. Plus if you're like me, you are friends with their moms too so it's a win all around. Or course painting pumpkins and carving them is going to be messy. Which is why this pumpkin decorating party which was sponsored by Mr. Clean is the perfect pairing; messy fun plus cleaning products. I was compensated for this party, including party supplies for my review. All opinions are mine. One big part of any party is getting your house ready. That isn't just decorations and food, although that's important too. 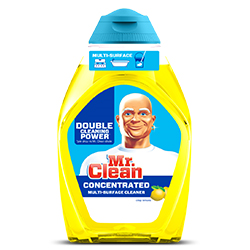 With double the cleaning power to knock out dirt, Mr. Clean Multi-Surface Concentrated Cleaner is a multipurpose cleaner that is tough on more than just floors. It will get your bathrooms, floors, and countertops clean for the holiday season. And it will rid your home of the sticky messes post-party. If you're going to throw a pumpkin decorating party you're going to need decorations, yummy food, drinks, pumpkins, paint, and craving tools. I bought a small pumpkin for each child to paint and one large carving pumpkin for each family to carve. With the ages of our kids, they were far more interested in painting the pumpkins than carving them. The carving fell to the moms and two teenagers that attended. I hosted my party right after school so food was going to be a big part of the party. It's crazy how hungry kids are after school. Since we were having a pumpkin party, food shaped into pumpkins was practically required. I went with a fruit/vegetable and cheese tray cut into a jack-o-lantern shape. They turned out really cute and were very simple to put together. Of course you can't have a party in the fall without caramel apples. I thought it would be more fun for the kids to dip the apples themselves. My son was not thrilled with the idea of eating a caramel apple, this was all I could convince him to do. Caramel apples weren't the only desserts served. I also made some pumpkin patch cups. Talk about a super simple dessert! All you need is chocolate pudding, ground up Oreos, and some pumpkin candies. Just layer them in a clear cup and you're ready to go. Totally kid friendly and you can make them the night before. For easy, mess free storage put the cups in a muffin tin and them top the cups with aluminum foil. The cups won't slide around so you don't have to worry about dropping one. It gets a little messy making the food too. I suggest feeding the kids before you try to start the decorating activities. Once you bust out the paint, things get messy. Plus very few kids can see food and wait to eat it. We had some awesome paint dabbers for the kids to use on the pumpkins. I also gave them paint and brushes so their imaginations can really run wild. And the kids did not disappoint both in their creativity and the mess that they made. After all the painting and carving was done I sent the kids outside to play. Once all the kids were outside I showed the moms how easy it was to clean up the party with Mr. Clean Multi-Surface Concentrated Cleaner. This was a first for me, I've never cleaned up while my guests were still at the party. But I wanted them to get excited about their party favor before they left the party. My floor looked pretty wrecked when the painting was done. Even with the paper down the kids found many spots on the floor to paint. And for once I wasn't all that worried about it. I knew that Mr. Clean Multi-Surface Concentrated Cleaner would take care of everything, even the paint. As it turns out the paint was not washable!!! What??? I always make sure that they paint we use is washable. Thankfully it wasn't until clean up time that I realized the error in my ways. But don't worry all the paint wiped right up with a sponge and one squirt of Mr. Clean Multi-Surface Concentrated Cleaner. I was shocked! We all were. I knew washable paint would come up easily, but I didn't think regular paint would. Normally it's almost impossible to get off, which is why I only buy washable paint. It also took off some permanent marker that my son used on my countertop. All moms know there is nothing scarier than a young child with a permanent marker in their hand. Thankfully it came off with a little elbow grease. The bathroom was pretty rough too after the party. The kids washed their hands in there, but somehow in getting clean, they wrecked my bathroom. I'm amazed how kids manage to touch every single surface in a room if their hands are dirty. And if you're washing your hands, shouldn't the paint go down the drain not coat the sink? You would think so but no, and here's the proof. Now that you've seen the fantastic cleaning power of Mr. Clean Multi-Surface Concentrated Cleaner I know you want to try it for yourself. One lucky reader is going to win a pumpkin prize pack. He or she will get the multipurpose cleaner, a carving kit, paint kit, seed scooper, and the amazing pumpkin bowl. I am in love with this Pumpkin Party Planning with Mr.Clean + Giveaway. Thank you very much for the photos. I have attended pumpkin party at some domestic Chicago event space and had great time. I wish I could have attended this one too!